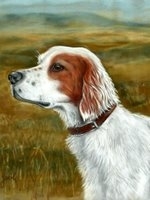 Gamble McCown creates custom pastel portraits of beloved pets and other animals. These portraits celebrate the lives and memories of our beloved animal friends. Her artwork helps preserve the feelings and memories of these animals through a wonderful artistic interpretation and expression. Beyond the personal enrichment these portraits can bring to our lives, the quality of the artwork will provide enhanced heirloom value as these editions stand the test of time. Please take a look at the Gallery Pages to see examples of high quality portraits created for other clients. The cost to produce a custom portrait based on photographs of your pet is very modest and several options are available depending on portrait size, framing and other details. You can also find More Information about the Prices and other Frequently Asked Questions. To say that clients who have commissioned portraits from Gamble have been very satisfied would be an understatement. Her artistic talent and ability to convey the uniquely personal character of each animal, in an expressive and memorable moment, has brought heartfelt emotional responses from many of her clients. Ultimately, these portraits really do celebrate the best memories and feelings that we have for these special friends. Please contact Gamble if you have any questions about commissioning a pastel portrait. You may also wish to review the Pricing and FAQ Pages for more information on pastel portraits. I love all animal and truly enjoy drawing portraits of working and sporting breeds, having been a dog handler and owner of a search and rescue German Shepherd dog named Tucker. We were deployed together on many missions, including recovery at the Pentagon after 9/11. 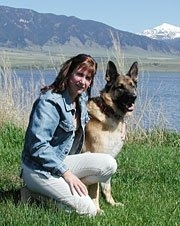 Tucker is now retired and I have more time to create keepsake artwork of beloved animals. Cilck on the link above to send me E-mail. Copyright 2006 Gamble McCown. Images may not be used witout permission.